So time to get this project done! After piecing everything back together and test fitting, it’s time to solder. 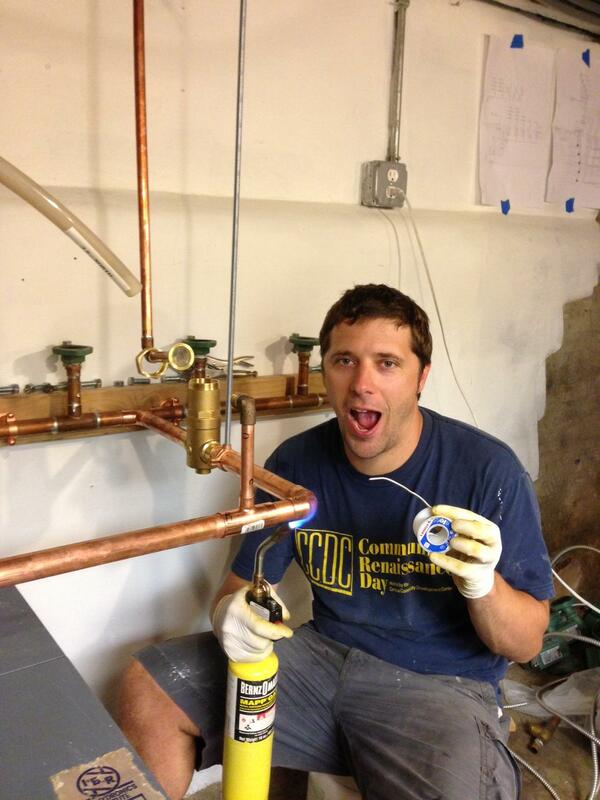 With the large 1″ pipe size I have been using MAPP gas instead of propane to really speed up the process. 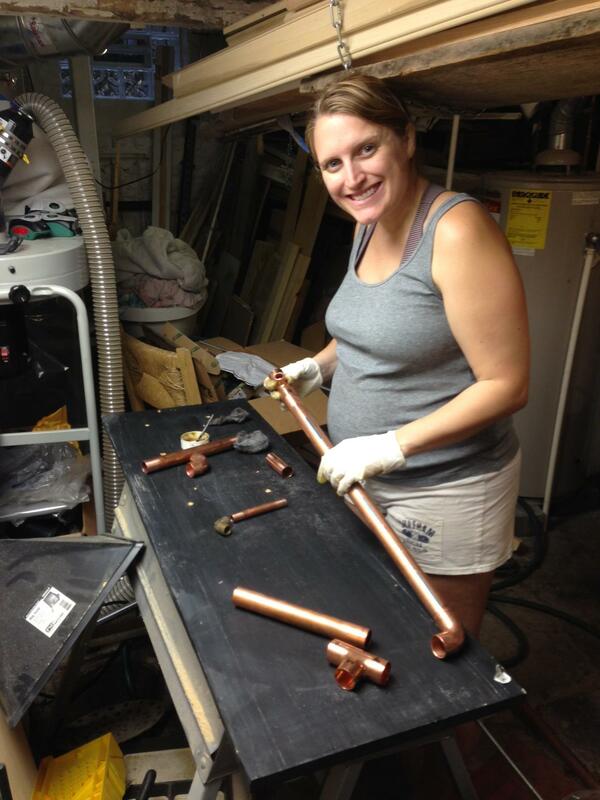 And also speeding up the process, Kelly cleaned and fluxed the pipes so as soon as I had soldered one, she had the next ready to go… I love teamwork : ) . As I said in the last post having both zone valves & circ pumps for each zone added some complexity to the controls… I was glad I figured it out in advance and did a single line drawing of it as not to forget while I was dealing with the mess of wires. The two large boxes on the left are for our wireless thermostats and the box on the right are the pump controls. We are ready for next winter with our new diaphragm expansion tank, air separator, automatic fill valve, and efficient zone valves! That is a pretty badass setup you have for your heat. I would love to do something like this to our house. I feel I have the technical aptitude to pull it off, I just cringe at the though of breaking into the floors and walls to run individual piping for each individual radiator. I currently have 3 loops and each radiator on that loop in is parallel and I would love to the ability to isolate a single one especially for renovations. Draining the majority of the water makes me cringe because I know when I do this I’m allowing rust to form since the metal is in contact with the air in the pipes. If you don’t mind me asking how much did the whole upgraded system cost? When we bought our house it was one zone for all 3 stories! 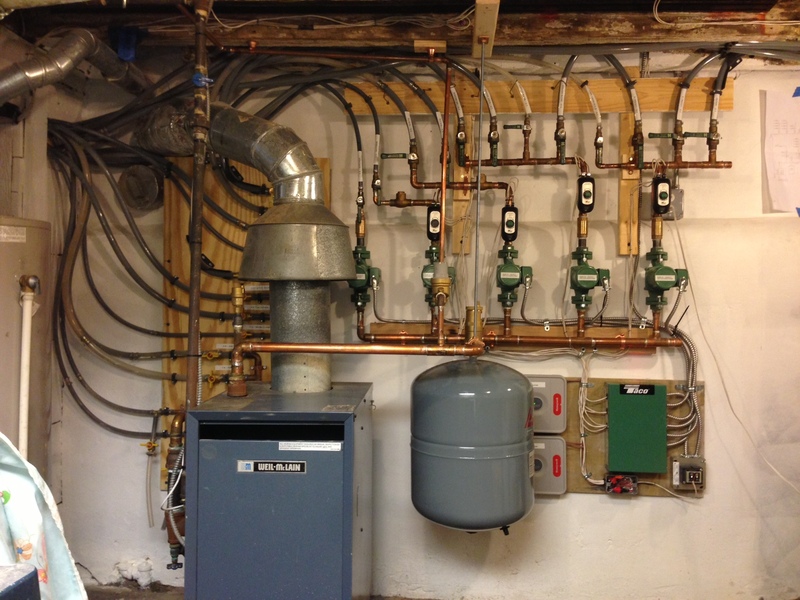 So we were really happy with this set up with each radiator being a home run to the basement and having 5 heating zones. I can’t image what the old heating bills were like. 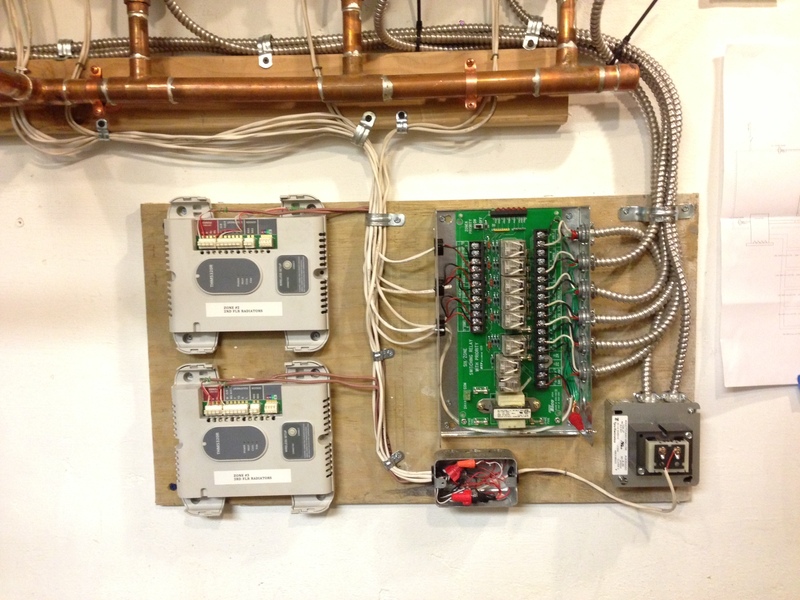 The system is also a lot more responsive since you are only heating one zone at a time and there is a lot less water to heat up in the pex compared to the old pipes before the heat gets to the radiator. We did not gut most of the house so we had to fish the pex through our old plaster walls and floors. It can be done, with a few choice holes here & there and 2 or more people to help pull the pex at the various holes on the long runs. Our radiators on the 3rd floor are a single pipe run with no joints all the way to the basement through floor joists, plaster walls, several turns, etc. It was a pain but we don’t need to worry about leaking joints concealed inside plaster walls. Expense wise, make sure you use pex with an oxygen barrier so you are not introducing more O2 into the system rusting your old radiators and use 3/4″ pex so you are getting enough BTU’s to those cast iron radiators. Those two things will increase the cost of the pex, so assume few hundred dollars for the pex. You will want valves on both the supply & return of each radiator, at $10 a pop. For the heating zones the zone valves around $75. 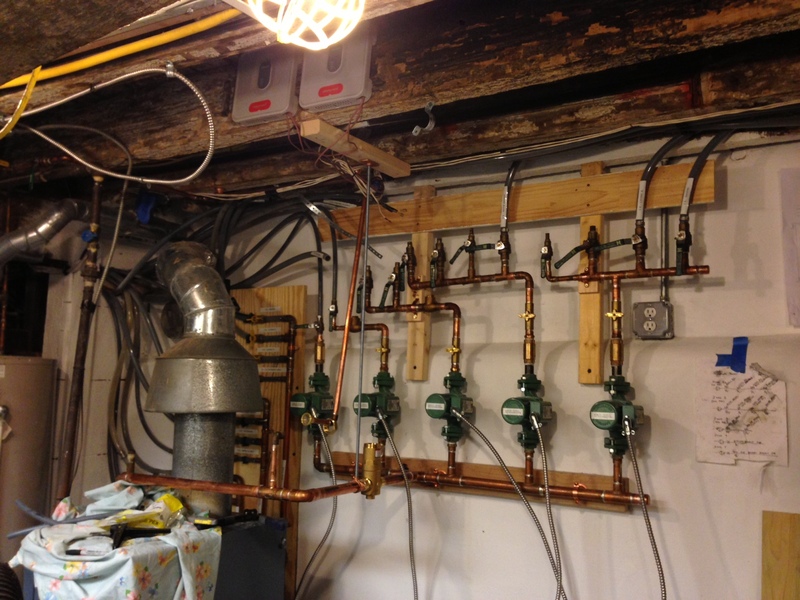 We built our manifold out of copper which you can easily spend $200 on pipes and pieces. 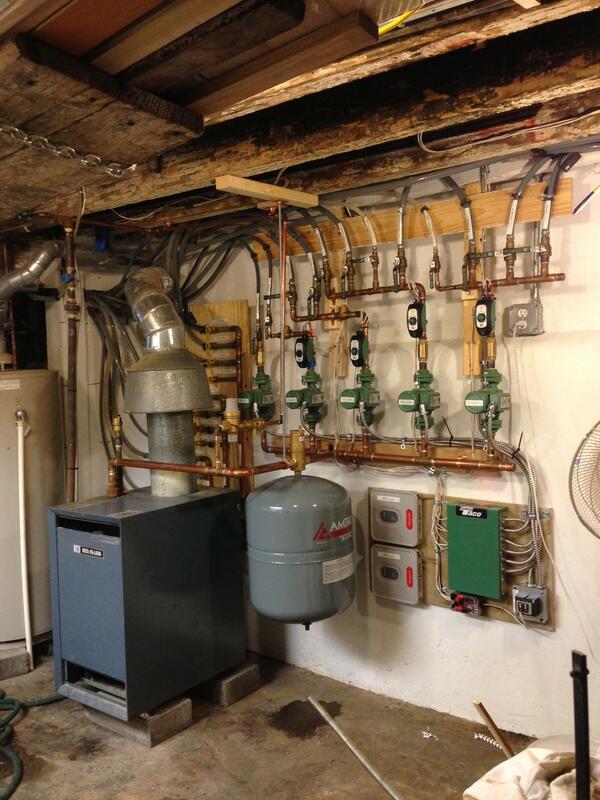 You could save some money if you find a premade manifold that works for you & go a single circ pump for all the zones. There is a good amount of labor to do all this so hopefully you will be doing this yourself. Hope this helps.